By now, Bill Murray’s offscreen antics are legendary — mythical, even. Did you hear about the time he crashed a house party and washed all the host’s dishes? How about when he photobombed a happy couple’s engagement pictures? Remember how he agreed to star in Garfield? Maybe you’ve seen Bill at your local bowling alley or serving up drinks behind the bar of your favourite watering hole. It could happen, because Bill Murray is always looking for a bit of fun. He’s spontaneous — no, he’s the living, breathing embodiment of spontaneity, and we love him for it (so much so that fans crashed the Toronto International Film Festival’s website in a bid to score tickets to his latest movie). We could all stand to inject a little more Billy Murray-style lightheartedness into our lives, and that’s why we’re celebrating Bill Murray Day by asking ourselves the question, ‘What would Bill Murray Do?’ This is not a list of dos and don’ts because Bill Murray doesn’t say don’t. Bill Murray says do. And so should you. Forget saving your nice clothes for special occasions! 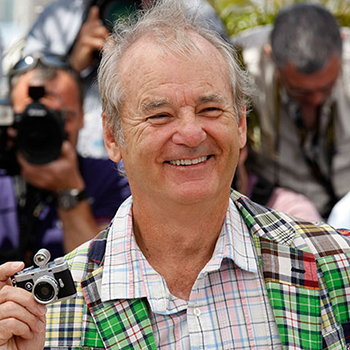 Bill Murray puts on a tux (or his favourite combination of plaid shirt and plaid blazer) any damn time he pleases. We bet there’s something sequined languishing in the back of your closet. Time for that special ensemble to see the light of day, even if it’s just a Tuesday. Between walking the dog, making everyone’s lunch, checking your phone to make sure a work emergency hasn’t arisen while you were sleeping, and finally getting the kids off to school and yourself to the office, the start of your day can be pretty hectic. What if just once (or twice, or three times) a year, you relaxed your morning routine? You could have a leisurely breakfast with your family… or get them out the door and take some quiet coffee-sipping time for yourself. Let Bill be your relaxation guru — no one has the gall to hurry him, not even awards show orchestra conductors! Bill Murray’s Lost in Translation character wasn’t afraid to belt out karaoke tunes in front of a group of people he’d just met. As legend has it, the real Bill Murray isn’t either. We doubt that Bill believes himself to be a world class singer, but that doesn’t stop him from getting his croon on, silly (and awesome) as it may sound. We suggest you follow suit. Escaping the city and surrounding yourself with trees is good for your soul. Just don’t think that you have to go this far into nature. You’re not Bill Murray. Constant travel is a given for any Hollywood star but while most A-listers stay holed up in their luxury hotel suites, Bill Murray goes out and explores his surroundings. You might find him checking tickets at a minor league baseball game or popping up at a stranger’s bachelor party to dole out sage relationship advice. Bill is out getting late night soft serve from an ice cream truck and turning up uninvited to house parties. He’s always making the most of wherever he finds himself and you should too, even if you never leave your hometown. Why stand silently in line waiting for your morning coffee when you could be striking up a conversation with the interesting human being next to you? It’s like Bill says, ‘a stranger is just a friend you haven’t met yet.’ (Or was that Kenneth from 30 Rock?) You know what, it doesn’t matter who said it because Bill Murray LIVES it. For goodness sake, the next time some random passerby asks you to be in their movie, do what Bill does and say YES! (Just make sure it’s PG-rated first.) Same goes for invitations to try an unfamiliar cuisine, check out a new local band, or join a Bill Murray-approved kickball league. Being active will give you the energy you need to do all of the above. Pick something you think you’ll like and run with it. Want to be more flexible? Try yoga. Pent up work-related frustrations? Give racquetball a go. Aiming to become a real team player? Maybe curling is for you. As for Bill, he likes golf. Stand up comedy, zip-lining, amateur wrestling, operating a Ferris Wheel, publishing a collection of poems, being first in line to touch see Benedict Cumberbatch’s new wax statue — we’ve all got a bucket list of things we’re aching to do. Don’t wait for the opportunity to arise, go out and actively chase down your dream (the way we’ll be chasing down a glimpse of Bill on his big day).